Develop upper and lower control limits (UCL and LCL) and determine the performance of a process over time. 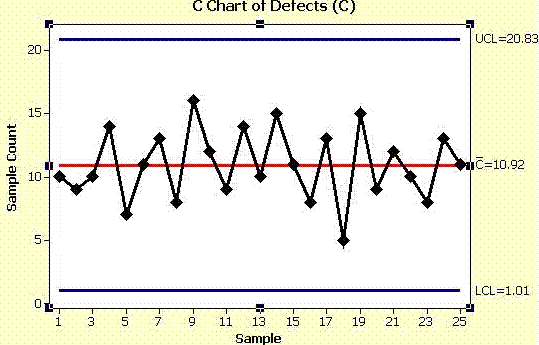 This chart plots the number of DEFECTS sampled, each observation is independent. Used to detect shifts >1.5 standard deviations. In order to detect smaller and quicker shifts there are other time weighted charts that can be applied to variable and attribute data such as Exponentially Weighted Moving Average (EWMA) and Cumulative Sum of Quality Characteristic Measurement (CUSUM). 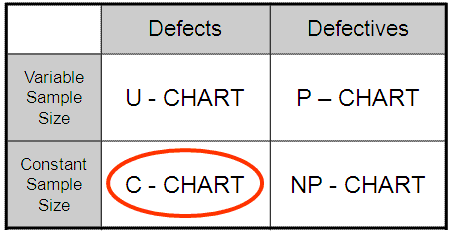 If the defect level is small, use the Poisson Distribution exact limits, DPU < 1.5. Shown below is a sample of data taken from 25 runs of a constant sample size. In all the runs, we sampled 12 widgets. In the first run, there were 10 DEFECTS found among the 12 widgets. 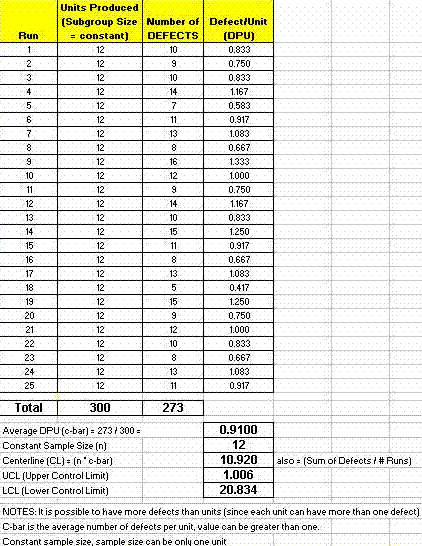 It does not say if all 10 DEFECTS were found in one widget or which amount, it simply says 10 in total were found between all 12 samples in Run #1. The chart below is the C-Chart representing the data shown above. The chart indicates that the process is in control. The control tests that were used all passed in this case. Recall there are a variety of control tests and most statistical software programs allow you to select and modify these criteria.